Recently, we commissioned nationally-respected firm Lord Aeck Sargent to complete an assessment and analysis of properties within the Urban Services Boundary (USB) of Fayette County. They examined all property within the existing USB and analyzed its possible use to accommodate expected continued growth of the city. This is an exciting and landmark study that provides the foundation for an intentional, responsible and sustainable long-term growth strategy for Lexington. As advocates for smart growth, we are pleased to share these findings with the community. 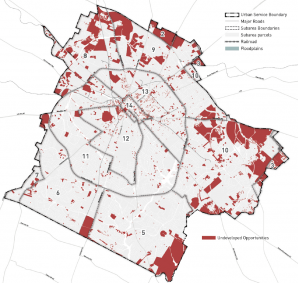 The study found a total of 17,164 acres of potential development and redevelopment opportunities, made up of the following categories – 5,616 vacant acres, 2,326 undeveloped acres and 9,222 acres of non-residential redevelopment opportunities within the existing Urban Services Boundary. These figures confirm and expand similar analyses carried out recently by the Division of Planning of Lexington-Fayette Urban County Government. The study was conducted utilizing data from the Fayette County Property Valuation Administrator (PVA). The area within the Urban Services Boundary was divided into subareas corresponding to the 2017 Housing Market Study. In addition, the methodology also included analyzing Floor Area Ratios (FAR) for non-residential properties to identify properties of low physical utilization. As Lexington evolves into a dynamic, vibrant city, it’s more important than ever that we continue to ‘grow smart’ by striking a balance between innovative development and the protection of our irreplaceable, productive Bluegrass farmland. Understanding where growth and redevelopment opportunities exist is paramount to our community’s overwhelming belief in and support of smart growth.